Peoples Democratic Party (PDP) president and former chief minister Mehbooba Mufti Saturday said her party joined hands with the rightwingBharatiyaJanata Party (BJP) for the welfare of people of the Valley. Addressing PDP workers at Wathoora area of Budgam, Mehbooba said the PDP founder and her father Mufti Sayeed could have become chief minister in 2015 with the support of Congress but he chose to join hands with BJP for the welfare of people of the Valley. “He (Mufti sahab) opted for BJP because he was concerned over plight of Kashmiri youth, who had stones and guns in their hands. 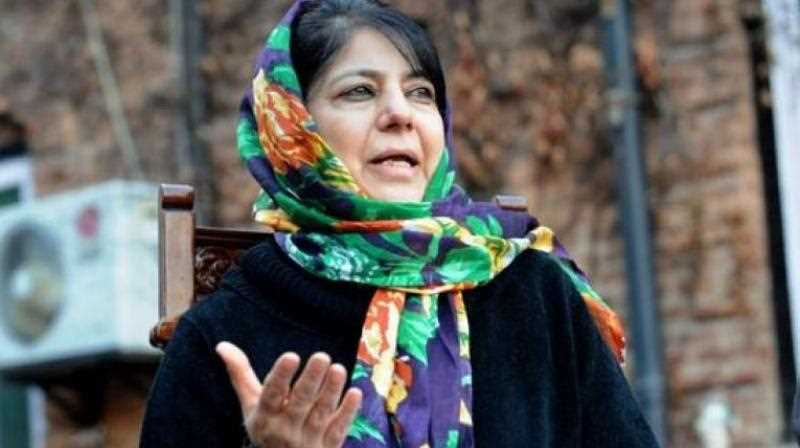 He was concerned about unemployed Kashmiri youth,” she said adding, “He believed that just becoming chief minister with any party’s support won’t help the Kashmiri people.”Mehbooba said Mufti’s decision to align with BJP is now being echoed by Pakistan Prime Minister Imran Khan, who also believes that Kashmir issue can be solved if BJP comes back to power. She is, however, sceptical about the current BJP’s capacity to solve the Kashmir issue. “In 2015, we thought Modi has a big mandate and he is a leader of Hindus, who have support of VHP, RSS and Bajrang Dal. But he couldn’t solve or even come near solving the problems of Kashmiri people,” the PDP President said. She said Prime Minister Modi missed a “golden” opportunity to work towards the resolution of the Kashmir problem. “Vajpayee healed the wounds of Kashmiri people and Mufti believed that Modiwill do the same. But he didn’t,” she said. Asking people to vote for PDP candidate Aga Mohsin for Srinagar parliamentary seat, Mehbooba said today the accession between J&K and India is under threat. “Your vote is very important. They are challenging our identity by talking about removal of Article 370. If Kashmiri people don’t vote then non-local labourers will soon have the voting rights here,” she said. Mehboobasaid PDP candidate Aga Mohsin is not a bigleader but at least he would not go to Delhi to chant those slogans which some leaders do. “Mohsinunlike other leaders will be visiting his constituency if voted to power,” she said. Claiming that PDP’s track record was crystal clear, Mehbooba said, “It was Mufti Sayeed’s government in 2002, which removed Task Force, POTA and opened Uri-Muzzafarbad road.We made the government of India talk with Pakistan and Hurriyat”.